Click Appendix on the main menu, the appendix management window will pop up, then click install button, the installation will start. Or, double click the .laf file, and it will start automatically. Lingoes provides a tool to manage an appendix and make a new appendix, so you can desige one yourself. To select appendix on main menu of Lingoes, the appendices options window will pop up. 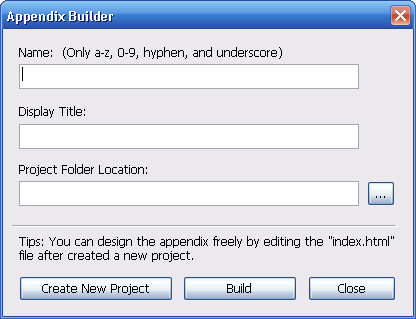 To click create my appendix..., appendix builder will appear on the screen. To make a new appendix in 3 ways: first all, you have to create a new appendix project, then edit the project files and design it as your idea. After finished design, compile it and create the installable file of the appendix. fill an appendix name, make an exclusivea name with 26 latin letters as the appendix name. select a folder to save the project and its files. click "Create New Project", a new blank project will be created in the appointed folder. Step 2. Edit the project files and design it as your idea. index.html Main file of appendix, you can make your own appendix via editing the file..
setup.xml The configuration file for installing the appendix into Lingoes. Please refer to index.html to learn about how to design the appendix. Step 3. Compile project file, and make the installation file of appendix. inished the design, fill in the path of folder which project locate in, and click "Compile", the installation file will be made. Then you can try to install the appendix and test it if it can work without any bug. Now, you should be able to make an excellent appendix yourself. If you would like to share your job with millions of Lingoes' worldwide users, just send it to kevin-yau@msn.com and attached your explanation. We will release it at Lingoes.net to recommand your work to all of users after testing. You are truly happy who makes others happy. We design so easy-to-use system and wish that it can bring surprise to every user. Don't hesitate to email me to kevin-yau@msn.com while you have some trouble during do it.